The balance between direct sound and reverberation is essential for the acoustic quality of audio recordings. 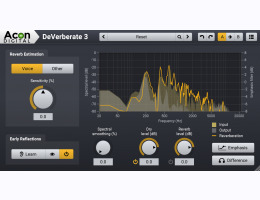 DeVerberate is a reverb reduction plug-in that can attenuate or boost the reverberation that is already present in recorded material. The novel real-time algorithm works equally well with mono as with stereo recordings and splits the incoming audio into an estimation of the direct sound and the reverberated sound which can then be recombined freely. The improvement process can be monitored visually using the spectral representations of the input and output signal as well as of the estimated reverberation.